The organ was used intensively until the 1940s, by which time it was no longer playable, and was replaced by a 46 key Gavioli. In 1976 the ride and both organs were sold and after restoration the ride was installed in Seaport Village in San Diego, California. The Gebr. Bruder organ was also repaired by a local pipe organ builder, and, because the cardboard music was worn out through years of playing, an attempt to control the organ by a computer was made. In 2004 the ride and organ were sold at auction to a private buyer: the organ was shipped to us in England for complete restoration. It was completely dismantled, re-leathered and supplied with a brand new repertoire of music books. 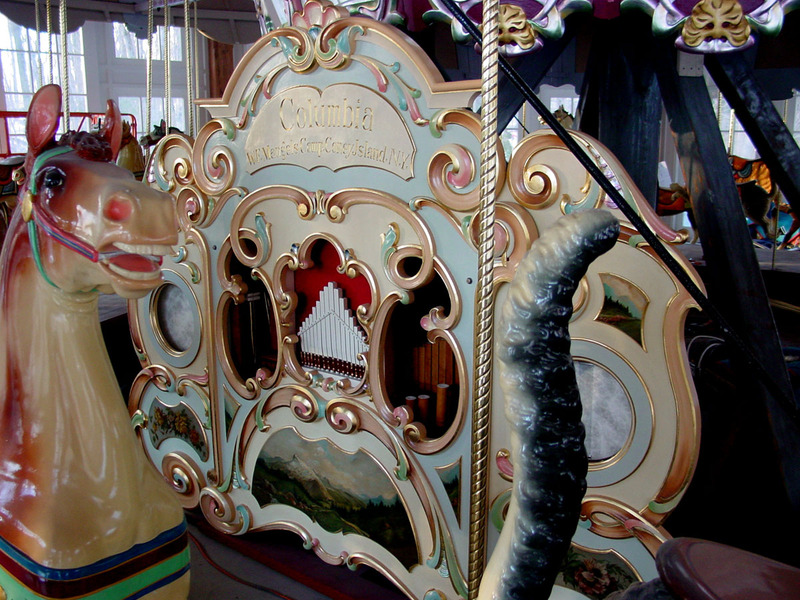 This instrument is a rare survivor in the United States, having never been converted from its original music system, and still playing in the same ride for which it was supplied over a century ago. The Gebrüder Bruder model 107 was a particularly successful produce of the Waldkirch firm and was in production from before World War One right through to the end of the 1920s. These organs are capable of producing superb music, despite the limited 52 keyless scale. You can read more about the Gebrüder Bruder firm and its products in the book “Waldkirch Street and Fairground Organs”.